Sakai Guides and DocumentationSakai Complete User Guide MessagesHow do I modify the settings for Messages? 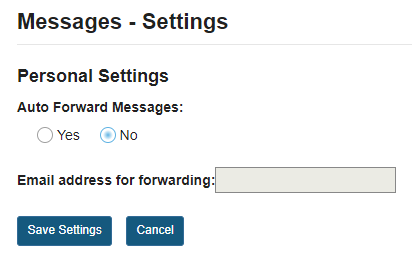 This feature allows users to modify the default Messages tool settings. Users with site owner permission have additional options for configuring the tool within the site. Select the Messages too from the Tool Menu in your site. As an instructor or site owner, you can choose whether or not site participants are able to forward messages, and which groups (if any) are hidden in the message recipient list. You may also set a personal forwarding email address for your own messages. If the site owner has allowed sending copies (i.e. 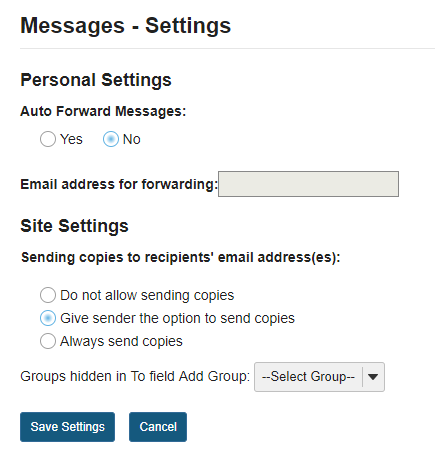 forwarding) messages, then site participants or students will be able to specify a forwarding email address. Once you have made all of your changes, click Save Settings to save. Prev: How do I delete a message? Next: How do I determine who site participants can send a message to?